Spay and Neuter at All Creatures Veterinary Hospital, Inc. The ADVANTAGES to spaying and neutering your dog far outweigh the consequences of not having the procedure done. You virtually eliminate the possibility of unwanted litters, reproductive organ cancers and infections, dog fights and injuries, and even some common behavior problems. The best TIME to have it done is before any problems get started so this means at the age before heat cylcles start. For most breeds that is around 5-6 months of age, but puppies as young as 8 weeks can have the surgery without any untoward effects. All procedures involving general anesthesia follow the same protocol. The patient is initially examined and risks and concerns are dealt with and then an appropriate drug regimen is selected for that pet. The patient is then anesthetized and prepared for surgery. Your pet will be followed from start to finish in the hospital with a caring and professional team of nurses and staff until your pet is back in your care. Before surgery we must determine if there are any pre-existing conditions that would require a postponement of surgery or require a specialized protocol to ensure patient safety. Some young dogs present with birth defects such as heart murmurs, hernias, undescended testicle(s), baby teeth that need removing, and even organ disease as detected on pre-surgical blood work. The older the dog at the time of the surgery the more likely possibility of finding problems and disease. Surgery during a heat cycle is not advised since the blood vessels are greatly enlarged and the risk of bleeding during and after surgery is greater. This is a situation that we find often and sometimes owners are unaware. This risk will be discussed and the surgery will likely be postponed until a few weeks after the cycle is finished. Other conditions that have been discovered on the pre-op exam and bloodwork are diabetes, heartworm disease, kidney disease, pregnancy, liver disease, and infection. After the exam and hopefully, bloodwork, the dog is then medicated appropriately before the surgery. Pain medication, cardiovascular support medication, and tranquilization drugs are used in combination and are catered to each individual pet's needs. This ensures the safest possible transition to general anesthesia and then transition back to recovery. All dogs will receive an intravenous (IV) catheter into a leg vein during this phase when your pet is more relaxed. This is your pet's lifeline to emergency drugs and or IV fluids as necessary during the surgery. With the pet quiet and relaxed, the next phase is begun which will put the patient into a state of deep sleep and then unconsciousness. This is a separate drug combination which is also tailored to each individual pet's needs. This is given via the IV catheter already in place and followed with a breathing tube placed into the pet's windpipe. This will remain in place and hooked up to an anesthetic gas that is delivered with each breath of oxygen. Monitoring devices in the surgery suite ensure a steady state of anesthesia throughout the procedure. The doctor and nurses use this monitoring to keep your pet as safe as possible during this time. Blood pressure and heartrate along with frequency and depth of respirations are used to determine the proper depth of anesthesia to provide unconsciousness, no sensation of pain, and good oxygenation of vital organs. A heated waterbed is also provided to help maintain proper core body temperature during surgery. No surgery should be considered routine, yet the spay and neuter procedure are the most commonly performed surgeries in this business. We treat every dog as if it were our own pet and no shortcuts are taken with your pet's life. Every surgery demands the same regard in professionalism and nursing care no matter how "routine" it may seem. With the patient safe and stable under general anesthesia, the surgical site is shaved and prepared. We try to be careful with the shaving clippers yet shave enough area to provide the doctor access to as sterile a field as possible. This sterile technique is adhered to throughout the procedure. The surgeon will don sterile surgical attire and gloves and use sterile instruments and materials which are unique for each procedure. Spaying requires removal of the dog's entire reproductive tract. It is a complete hysterectomy with removal of both ovaries and the uterus. 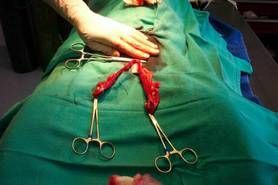 Overweight pets, pregnancy, in heat, or uterine infection can make this "routine" surgery LIFE THREATENING. These factors hopefully are known ahead of time and precautions are taken to reduce your pet's risk. Sometimes we don't know of these conditions until we get the patient onto the surgery table. We are prepared to handle any kind of risk presented at this time, but it is nice to not have to deal with unforeseen problems. You can do your part by seeing to it that your pet is spayed when she is young and healthy. At the conclusion of the surgery your pet will then be removed from the surgery suite and the anesthesia machine is turned off and your pet will be breathing room air. A bed is prepared for your pet and the transfer will take place. The breathing tube will be removed once we can see that the patient is showing signs of recovery by blinking and swallowing. Your pet will be covered with a blanket and will be watched the rest of the day until you come to pick them up. All patients will be able to walk out the door at the end of the day. It will then be determined if an Elizabethan collar will need to be sent home. The stitches from surgery will not be visible since they are buried under the skin. Most pets will not lick at this area, but if they show signs of bothering the incision, an E-collar will be sent home to prevent access to the site. We also have available a nasty tasting gel to apply directly to the wound. A prescription for extra pain medication can be called into your pharmacy for your pet to use as needed. Post op exams are welcome anytime within 30 days and of course, are free of charge unless medication or supplies are dispensed. Plan to keep your pet quiet and dry for a good 10-14 days. The same anesthesia protocol is used for cats as for dogs so that paragraph can give you the details of this topic. There are differences in reasons why we advocate this surgery due to the natural tendencies of this species. Spaying a cat before her first heat cycle makes no differences in future mammary or uterine health. The main reason we spay our cats early is to prevent litters of kittens that you have to find good homes for or perhaps add to the population that you are caring for. If left to her own devices a female cat (queen) who lives out her average lifespan of 8 years in the wild, can find a mate (tom) and produce over 70,000 cats! Who is going to feed and care for them? No one! This is a worldwide problem that we have no right to contribute to. Spay and neuter all cats ASAP. Kittens as young as 8 weeks can be sterilized without untoward effects. We usually perform this surgery between 3 and 8 months of age. Cats can safely be spayed (ovario-hysterectomy) during a heat cycle or pregnancy. Males can be neutered anytime once both testicles are into the scrotum. Recovery time for cats is about half that for dogs. Again, there are no external stitches for them to chew on. This is a normal dog uterus. This is a pregnant dog uterus. 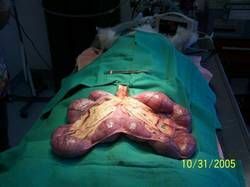 This is an INFECTED dog uterus.